Fall would not be complete without a little Yankee Candle. And that’s just a fact. However, this is my first year getting Macintosh after craving the scent all summer (I usually get Harvest or Autumn Wreath). I would not recommend getting the same jar and wax that I did, though. It’s the one wick Tumbler with the “smooth” wax (as I’ve heard it be called). It just did not give a good throw at all, even in my small bathroom. I couldn’t smell it! I’ve heard that type of wax is just awful and wanted to test it for myself. Never again. If I’m going to get a Yankee Candle, I have to make sure it’s in the regular “marbled” wax. Or a tart. Good thing I got this candle on a major sale! Can we talk about how cute those Vent Sticks are? A pumpkin and a turkey? Pure marketing genius for festive junkies such as myself. Not only does my car smell good, but it’s decorated in it’s own little way, too! November 1st, those turkey’s will be on my vents! And the last thing that’s new this year is the gold leaf Illuma-Lid jar topper. These are a great way to stay festive and catch a lot of the soot the wick gives off. It’ll also help the candle have an even burn. 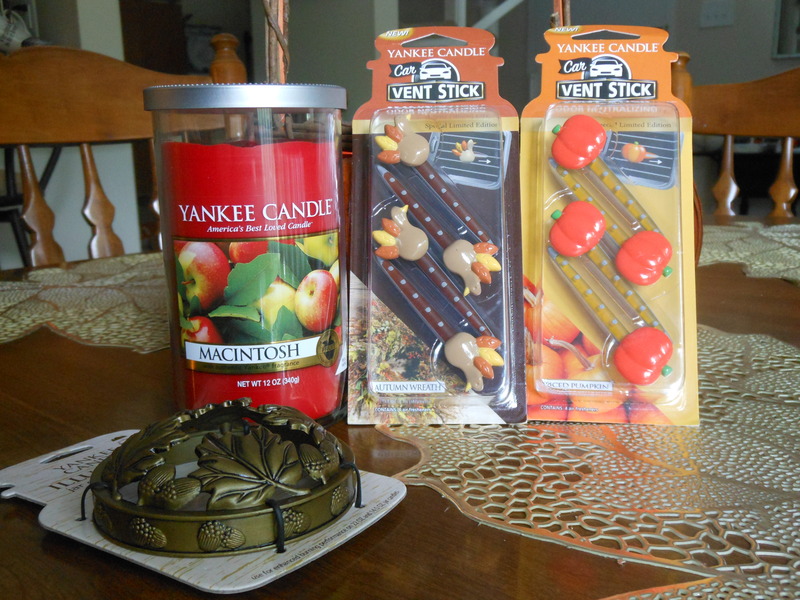 What Yankee Candle accessories or scents did you get this year? What are your seasonal favorite scents from the company? You can never go wrong with Yankee candles! My favorites are the pumpkin spice and salted caramel– yum!! Pumpkin Spice is also a good one! I think that’s what the pumpkin Vent Sticks were.